When we set out to do Tastemakers, we had an ambitious list of working individuals with obvious influence. As we began to check off names and tell their stories, our interest shifted on whom we wanted next. Through different outlets, we learned of new people to feature – people off the radar but equally significant. After all, our disclaimer does read that we “connect with the discovered and the underground, in industries from art to entrepreneurship, from music to fashion.” Here we go. Earlier this year, I came across images that instantly grabbed my attention. They were of spray cans stripped raw and rebranded with the names and logos of brands in the luxury, sport, and street markets. After more research, I found out they were part of a collection called BRANDALISM by Antonio Brasko, and he would be showing pieces at a gallery that week in LA. So I went. I was first drawn by his ability to get the branding and iconic colors so spot on, then by his choice of brands to use in the experiment. And finally, by the kind of dialogue his show evoked. I ended up writing an article on Fatlace about it and explored ways BRANDALISM could have been interpreted. Through my social media channels, I invited readers to discourse and it somehow got to Antonio. After the trading of backgrounds, accolades, and gratitude, I realized he was part of Tastemakers’ new focus. He may be behind the scenes on a number of projects, but you do know and experience his work. Antonio Brasko is a Tastemaker. Seven years ago, Antonio sold everything, packed whatever was left and bought a one way ticket from Tampa, FL to Portland, OR. He didn’t know anyone nor had he ever visited . But he did know that Portland was home to a creative circle that he wanted to be part of. It included Nike, Dr. Martens, Adidas, Pendleton and many others. Having studied both photography and design back home, the intent was to juxtapose himself among these giants, build relationships, and start sharing his passion for visual arts. A couple of months after he set up shop in a new city, an opportunity into the circle presented itself. First up was Adobe. 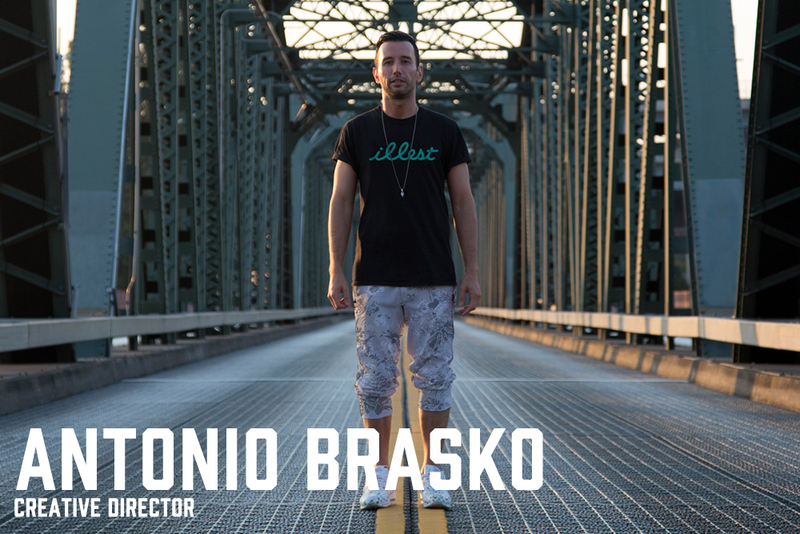 While he was earning membership into Portland’s creative circle, Brasko was also working on his own endeavors. One of them is Norwood, a brand inspired by his move to the Northwest, serving as a creative outlet without corporate rule. His goal is to fill a gap in the Portland street/menswear market by combining the city with the outdoors. It is both untapped and challenging, but capable of pioneering a new culture. Since 2012, the brand has shown at the Agenda Tradeshow and has seen a progressive trajectory from headwear to outerwear. Also on Brasko’s resume is a community event called GoSkatePDX. He teamed up with colleagues and creative agencies to establish Portland’s very own Go Skateboarding Day. The inaugural event was held on June 21; blocks were closed off, ramps made out of recycled skateboards were used, and 1200 people were in attendance. The efforts of GoSkatePDX will later translate to a skate park in the city. Having come from a skate background back home in Tampa and having skate brands be such an influence on his career, GoSkatePDX has allowed Brasko to feel at home. And finally, there’s BRANDALISM. Which is what originally brought me here. The experiment that started with five spray cans has become a full on show. His goal was to integrate fashion and graffiti in a way that was never done before but resonated with him. He is now taking the concept to its next phase – through boomboxes. Right now, he has ideas for Chanel, Jordan, and Supreme. The boomboxes are wired so that you could actually plug your iPhone/Android device into them so that during the next BRANDALISM show, you may actually have music coming out of each brand’s box. So now you know about the guy who’s responsible for the artwork around the Dr. Marten’s retail stores or the Nike 3M Reflective Windrunner shots all over Nike.com. His ability to connect with the consumer through design and experience is pretty neat. And although he may fall into the category of undiscovered or behind the scenes, he has the same kind of gusto our preceding Tastemakers have. He adventured into unknown territory, had patience to endure the hard parts, and kept going. Brasko now has the portfolio he wanted and a few other cool things worth mentioning.